More information is available here: http://www.womenwritingthewest.org/currentWWWConference.html. M.L. 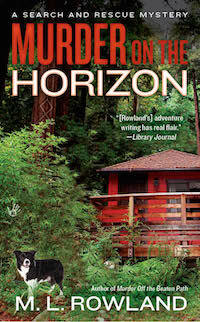 Rowland’s Murder on the Horizon, the third in the breakout series of Search and Rescue mysteries, releases August 4, 2015. The series is published by Penguin Publishing Group under its Berkeley Prime Crime label. Gracie and her Search and Rescue teammates are searching along the highway in the middle of the blisteringly hot Mojave Desert when they make a grisly discovery—a trash bag containing human body parts. Not long after, Gracie’s growing friendship with a ten-year-old runaway draws her unwittingly into the secretive, hate-filled world of the boy’s family—a group of gun-toting extremists. As a wildfire roars into Timber Creek, Gracie finds herself caught up in an explosive plot that, unless she stops it, will destroy countless innocent lives. For a dozen years, Rowland served as an active member of a busy mountain Search and Rescue team in southern California, participating in hundreds of missions and trainings. Many of the area descriptions, incidents and Search and Rescue protocol and procedures are based on her experiences on the team. Soft-cover and electronic versions of all three books are available at Amazon (www.amazon.com) and Barnes and Noble (www.barnesandnoble.com), in Barnes and Noble bookstores, as well as local bookstores and libraries. Born, raised and, except for one year of high school in Hawaii, schooled kindergarten through college in Michigan, Rowland comes by her adventurous spirit honestly. Her mother was Grand Rapids, Michigan’s first woman city commissioner. Her father—a neurosurgeon and marine scientist—was a world traveler and member of The Explorer’s Club. After college, Rowland lived and worked in Florida, Missouri, Connecticut and New York City, finally settling in the mountains of southern California where she and her husband, Mark, joined the local Search and Rescue (SAR) team. During her twelve years on Search and Rescue, Rowland participated in hundreds of search and rescue missions and trainings, including technical ropes rescues and recoveries, helicopter insertions and evacuations, and searches for lost children, hikers, snowboarders, mountain bikers and criminal evidence, in alpine, desert and urban environments. She served as the team’s Training Officer and participated in community events and public speaking engagements. Trained in land navigation, and desert and winter survival, including avalanche awareness and self-arrest, she also holds a certification in tracking from the State of California. Much of what she writes about in her Gracie Kinkaid Search and Rescue Mystery Series is drawn from her and her husband’s SAR experiences. Rowland also served on the advisory Board of a Colorado County Sheriff’s Department All-Hazards Incident Management Team (IMT) which manages local search and rescue operations, brush and wildfires, planned community events and other critical incidents. Rowland is an avid political activist, naturalist and environmentalist. She’s an accomplished painter and loves to snorkel. Topping her bucket list: snorkeling with whale sharks. She has traveled to all fifty United States and throughout the world, including Kenya, New Zealand, the South Pacific and Europe. As often as possible, she hikes and explores the slot canyons of Utah. Rowland lives with her family at the foot of the Sangre de Cristo Mountains in south-central Colorado. Visit her at www.mlrowland.com. Announcing the Colorado chapter of Sisters in Crime! Sisters in Crime members are writers, readers, booksellers, librarians, bloggers, and others with an appreciation for the mystery genre. Those who join the Colorado chapter must also belong to the national Sisters in Crime organization, whose mission is “to promote the ongoing advancement, recognition and professional development of women crime writers. Membership is open to all persons worldwide who have a special interest in crime and mystery writing and in furthering the purposes of Sisters in Crime, Inc.” Colorado chapter membership costs $20 annually and runs from January to December. Note: dues paid between October and December will include the following year’s membership. To join Sisters in Crime-National, please click here. To join Sisters in Crime-Colorado, please click here.